R. Fox and S. Oross, III, Perceptual Deficits in Mildly Mentally Retarded Adults. S.A. Soraci, Jr. and M.T. Carlin, Stimulus Organization and Relational Learning. W.J. McIlvane, Stimulus Control Analysis and Nonverbal Instructional Methods for People with Intellectual Disabilities. P.D. Tomporowski and L.D. Hager, Sustained Attention in Mentally Retarded Individuals. A.M. Clarke and A.D.B. Clarke, How Modifiable is the Human Life Path? J.G. Borkowski, T.L. Whitman, A.W. Passino, E.A. Rellinger, K. Sommer, D. Keogh and K. Weed, Unraveling the "New Morbidity": Adolescent Parenting and Developmental Delays. J. Carr, Longitudinal Research in Down Syndrome. C. Cullen, Staff Training and Management for Intellectual Disability Services. T.R. Parmenter, Quality of Life of People with Development Disabilities. Index. Contents of Previous Volumes. This serial was established under the editorship of Dr. Norman R. Willis in 1966. 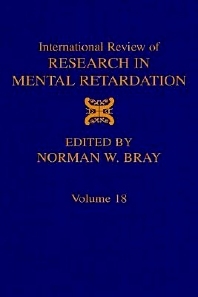 As a result of his editorial effort and the contributions of many authors, the serial is now recognized as the area's best source of reviews of behavioral research on mental retardation. From its inception, active research scientists and graduate students in mental retardation have looked to this serial as a major source of critical reviews of research and theory in the area. These volumes are required reading for any professional seeking a deeper insight into the behavioral consequences of intellectual and developmental handicaps. AUDIENCE: Researchers and graudate students in developmental and cognitive psychology.